Once you have chosen you wedding date and location, it is time to start thinking about your wedding stationary. This may include save the date cards, announcements and invitations. There are many wedding announcements & invitations styles from which to choose – from formal to casual, from silly to serious. 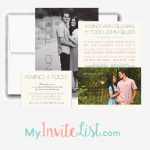 Make sure your wedding announcements & invitations fit your style and personality. Don’t worry too much about the wording- all people really need to know is that you are in love and you’re getting married. 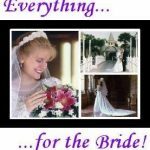 No matter where you live – Salt Lake, Utah Valley, Ogden, Logan, Southern Utah or Southeast Idaho – you can find a Wedding Announcements & Invitations vendor in your area to visit in person. You can also do your Wedding Announcements & Invitations completely online. 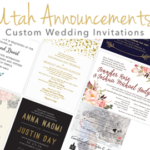 Spread the word about your engagement and wedding with one of these Utah Wedding Announcement or Utah wedding invitation vendors. For more information about choosing your wedding announcements and invitations, click on Announcements & Invitations Tips. Fantastic job on my daughter's wedding invitations. Welcome to Ellis Printing, Ogden’s full-service printing company for over 30 years. Contact us today for all of your wedding announcement and printing needs. We understand that collecting addresses for your big day can be a stressful thing but that is why we developed MyInviteList.com, a FREE wedding address collection tool! I cant say enough good things about Basic Invites! Basic Invite is definitely the place to go for everything! Your colors, your style, your photos, INSTANTLY! Custom wedding invitations perfect for the budget bride. Check out the state-of-the-art website now. Custom Photo Wedding Invitations and Announcements done right the first time. We know you will be overly impressed when choosing Pro Digital Photos for your wedding invitations! 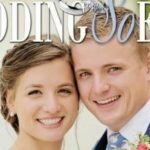 We specialize in Cache Valley and Utah Wedding Announcements and Invitations - from preset to custom design. Ask about our wedding specials! Design your own wedding invitations online for FREE! Send a Slideshow With Every Wedding Invitation! Come and see us or use our online designer system to create your wedding invitations, wedding announcements, inserts and thank you cards. We will print them for you. Passion for printing? We've got it! Our goal is to provide you with the very best printing & the possibilities are endless! For your custom wedding invitations, we offer Letterpress printing, Thermography (raised ink), Full-Color printing and more! Create your perfect wedding invitation by working online with your own dedicated designer. Getting custom wedding invitations may seem like a daunting task, but let me reassure you, it's not. At Twelve 30 Creative, every single wedding invitation we make is made from scratch just for you. Custom Wedding Invitations personalized to your needs. We provide free consultation on your invitation design and the design work is very affordable. To see samples of our invitations click on the link to our website and then the link to our new website. 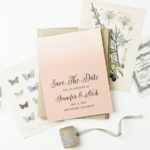 Wedding Invitations for EVERY Theme, Style, Budget & Bride! Nichols Photo Lab, Inc. has been committed to being second to none. Let us provide your wedding announcements. Personalized & uniquely designed invitations to announce your wedding with style. Serving Logan, Utah & Beyond. We can easily work over the phone & email to complete your project! Unique Selection of Custom Wedding Invitations. No appointment needed to drop by our studio and browse in a no-pressure setting. Bride's Choice Award winner for 2013! We are experts in creating beautiful custom wedding invitations, and our award-winning invites (and personalized service) make getting the perfect wedding invitations easy. Contact us today to get started!